Here is the tutorial I promised you!! 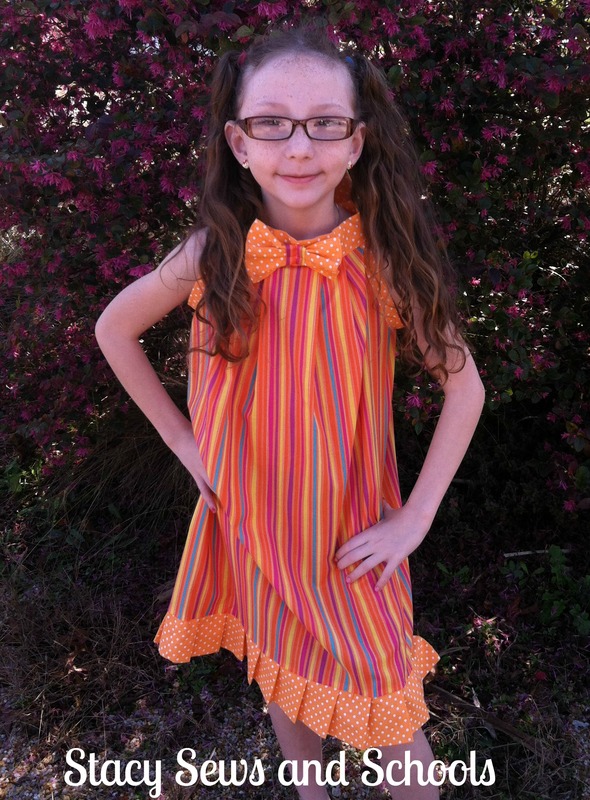 😀 This is dress that I sewed for the Project Run & Play Season 6 Week 2 Challenge – Stripes and Polka Dots Sew Along. 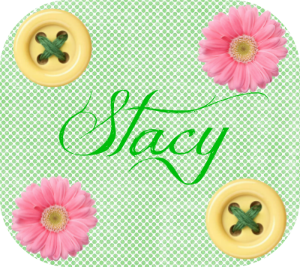 If you scroll down the page you will find the link up where other bloggers have added their Week 2 outfits. You should check them out! There are some seriously talented ladies there!!! 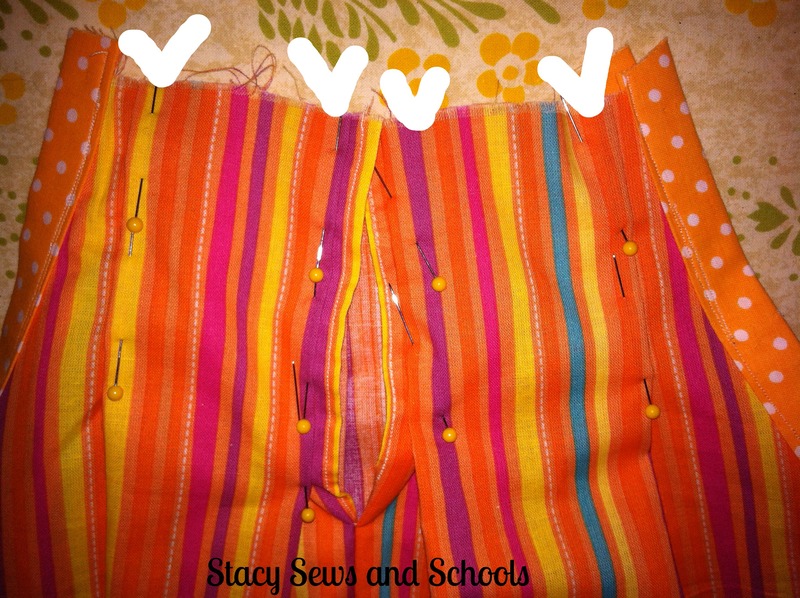 Fold the sides of the opening in by 1/4″ and again by 1/4″. Sew in place. Cut 2 long strips about 2 1/2″ wide. Fold the sides in and press. Now fold in half and press. 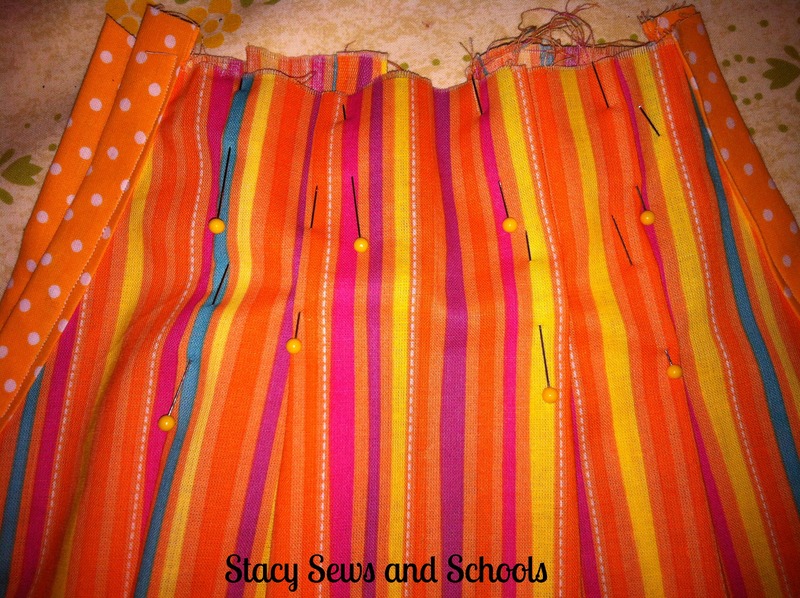 Open up the strip and fold over the edges of the arm holes, pin and sew in place. Time to add the pleats at the neck line! 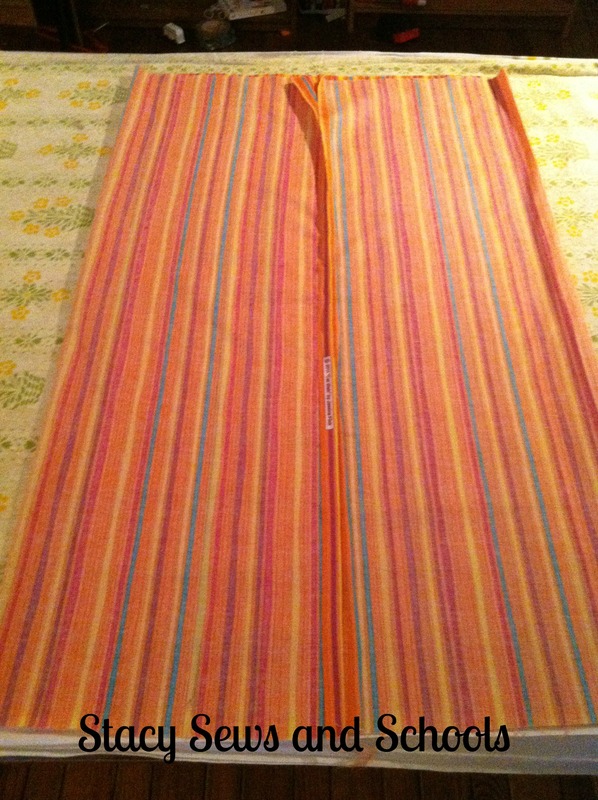 To pleat you basically fold the fabric behind itself, press and pin in place. 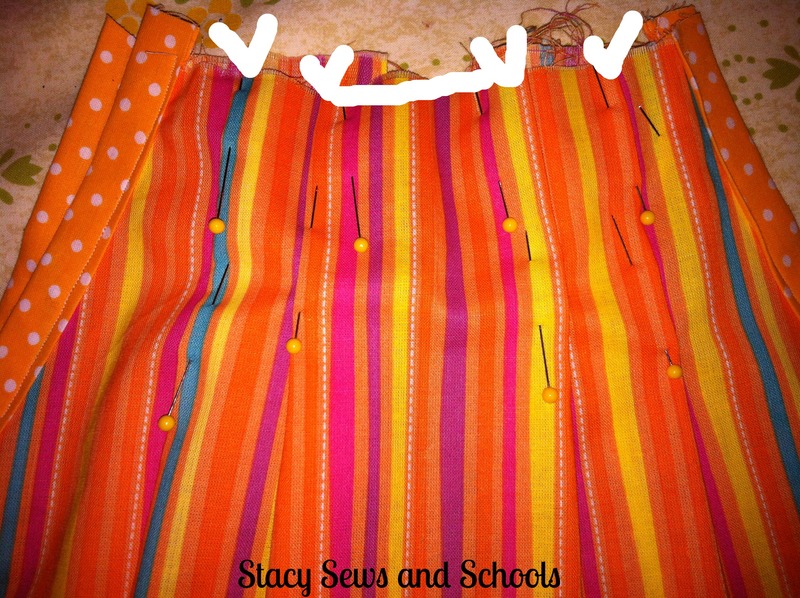 I marked the places where I put the pleats. 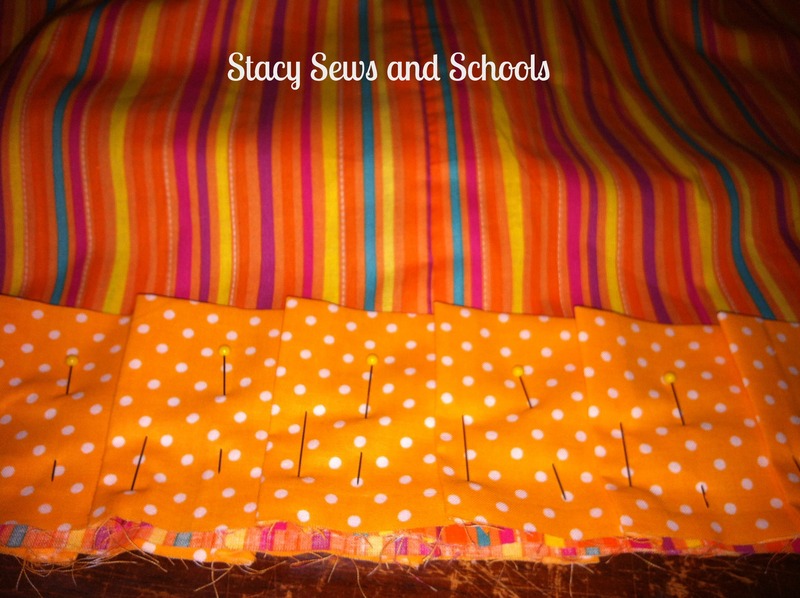 Now put 2 rows of stitches across the top of the pleats to hold them securely. 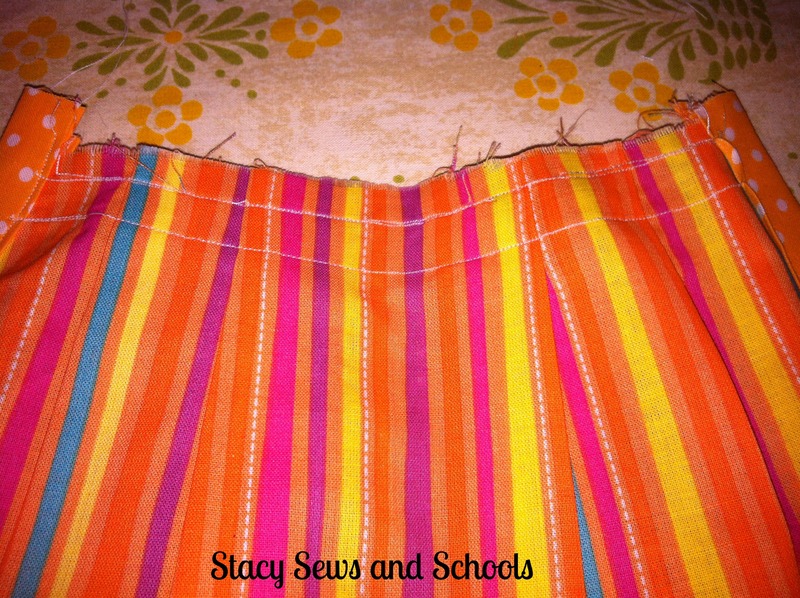 Add pleats to the back and sew 2 lines of stitches across the top. 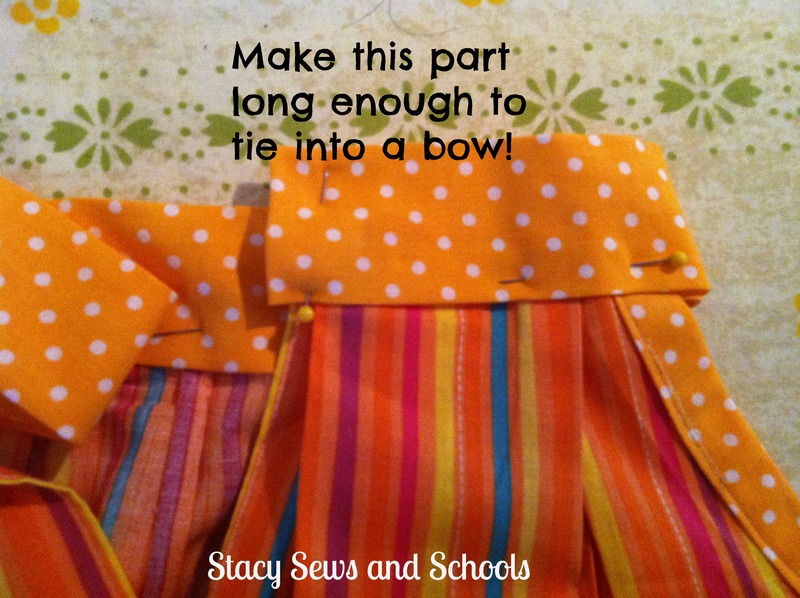 Cut a long fabric strip (long enough to fit very loosely around your child’s neck AND tie a nice bow). 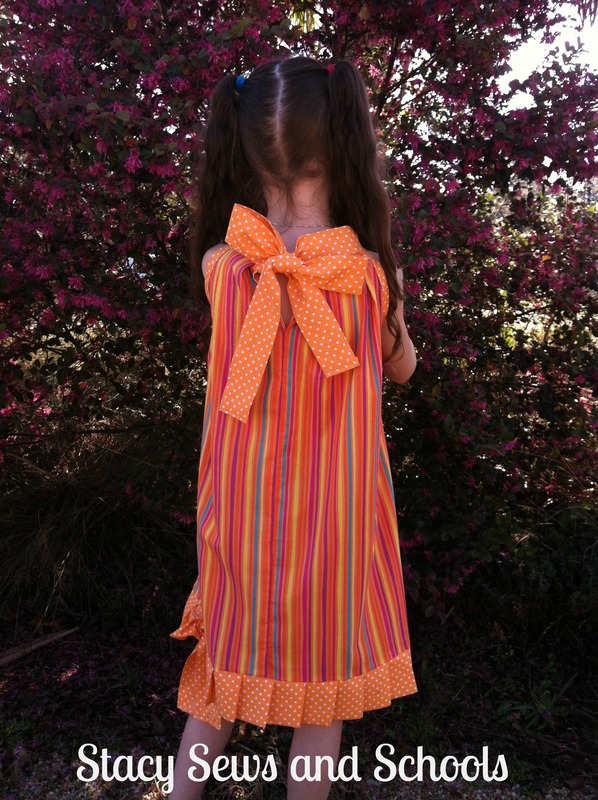 The width of the fabric will depend upon how long your child’s neck is. 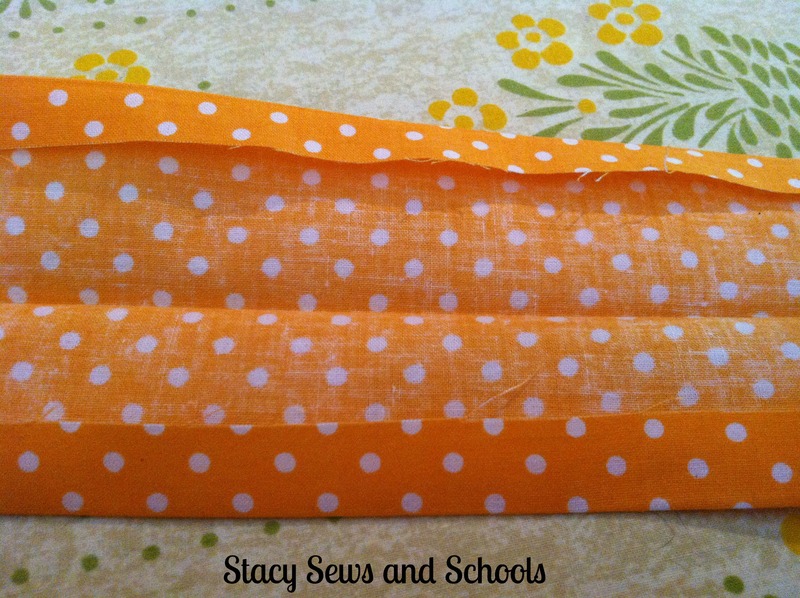 Fold over the edges by 1/2″ and press. Fold in half and press again. 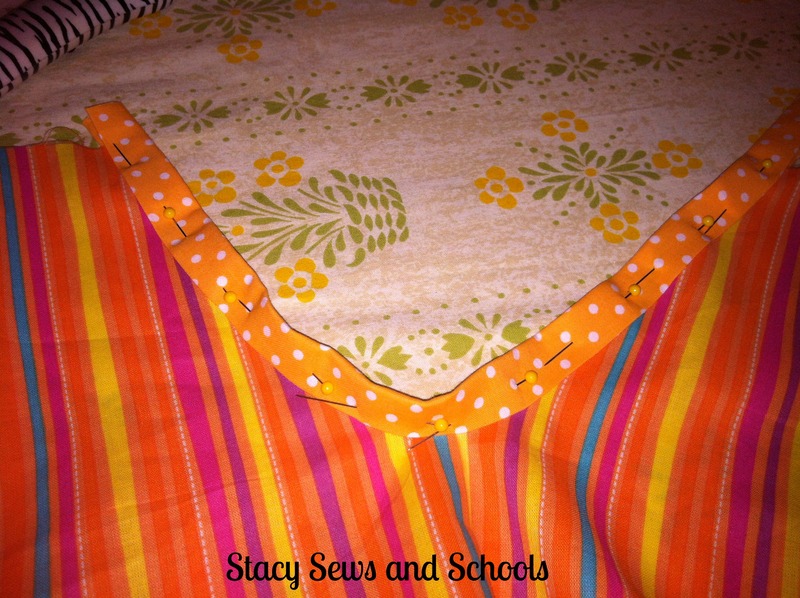 Open up the middle fold and pin in place over the neck line. 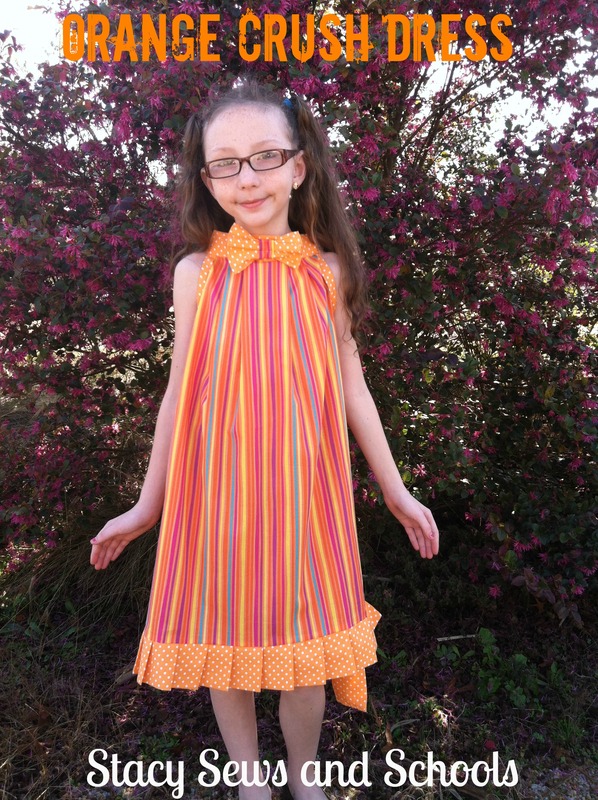 Now, the bottom pleats!! This can take a little while…. 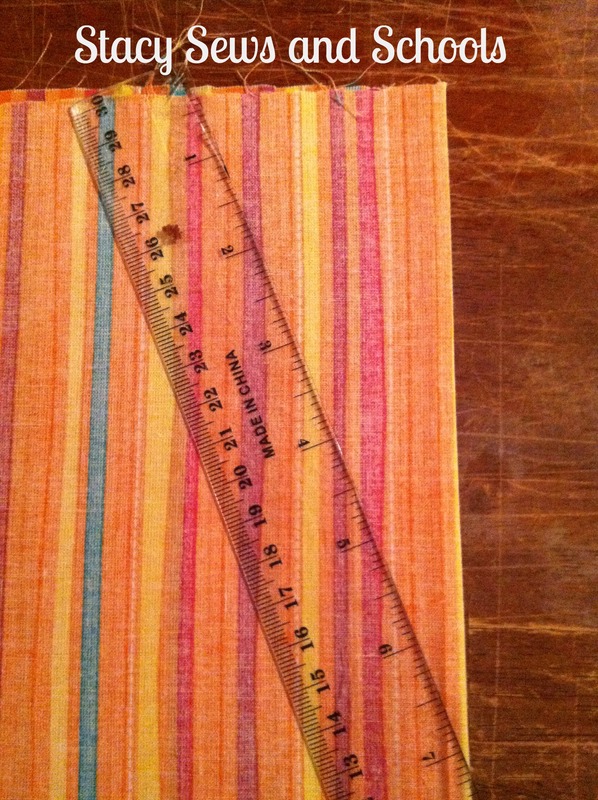 LOL I used a strip that was 6″ wide by about 80″ long (2- 40″ strips sewn together). Fold the strip in half and press making it 3″ wide. Now start pleating, pressing and pinning until the whole thing is pleated! 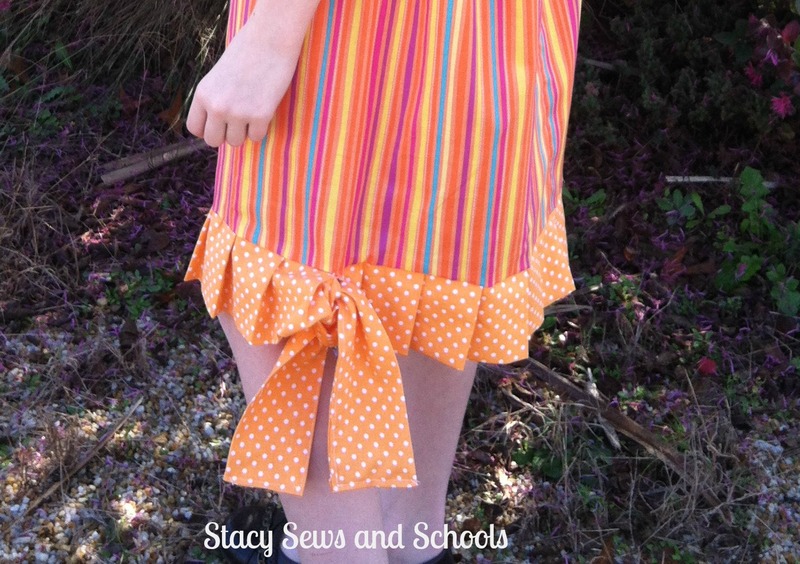 Pin the top of the pleats to the bottom of the dress (right side) and sew into place. When you get to the edge of the dress, leave the rest of the pleated part unattached. Press out the remaining pleats. 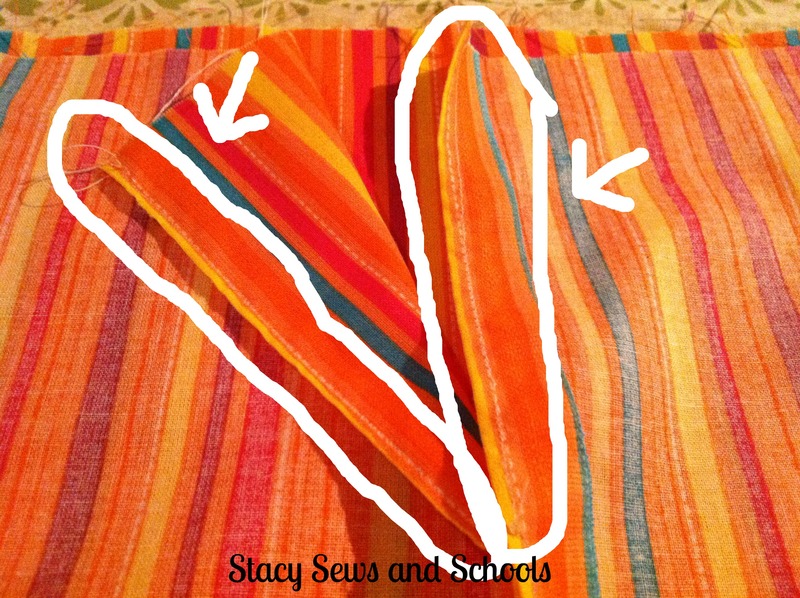 Fold the end edges in by 1/4 and sew closed. Now tie the remains! 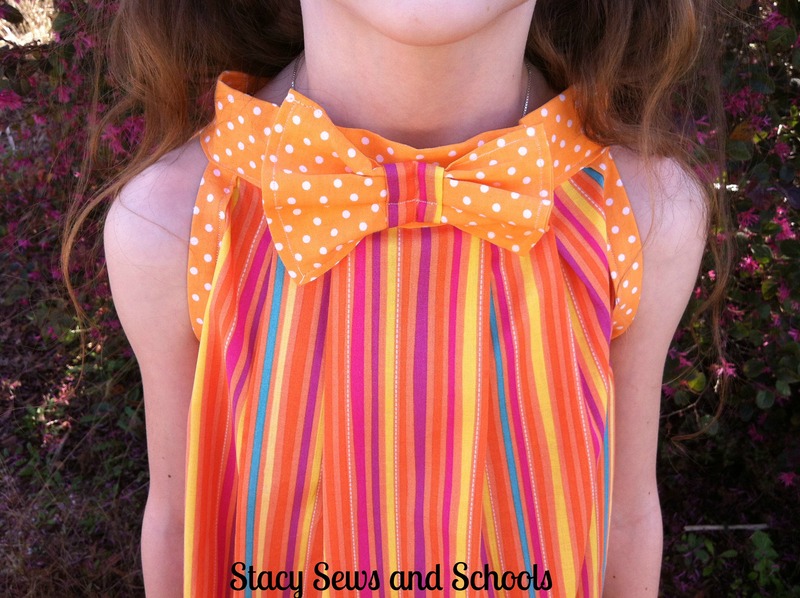 The bow at the neckline was an afterthought but easy enough to make. I used a 7″ x 5″ rectangle. 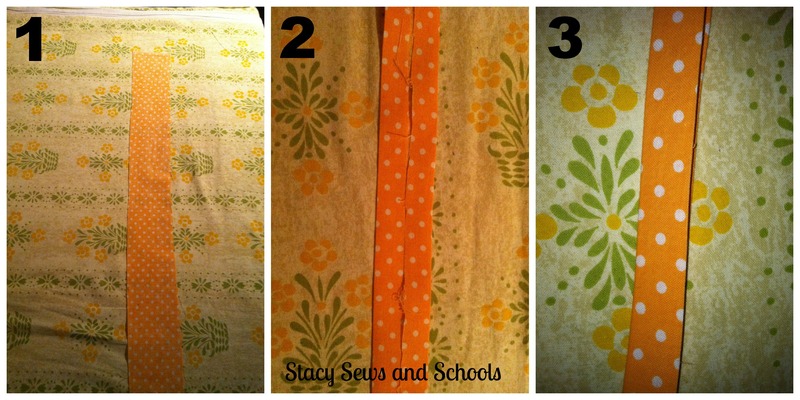 Fold it over and sew 2 sides (right sides together). Turn right side out and press. Turn the raw edges in and top stitch around all 4 sides. Take a small strip about 2″ x 3″ and fold in the sides by 1/4″ and press. 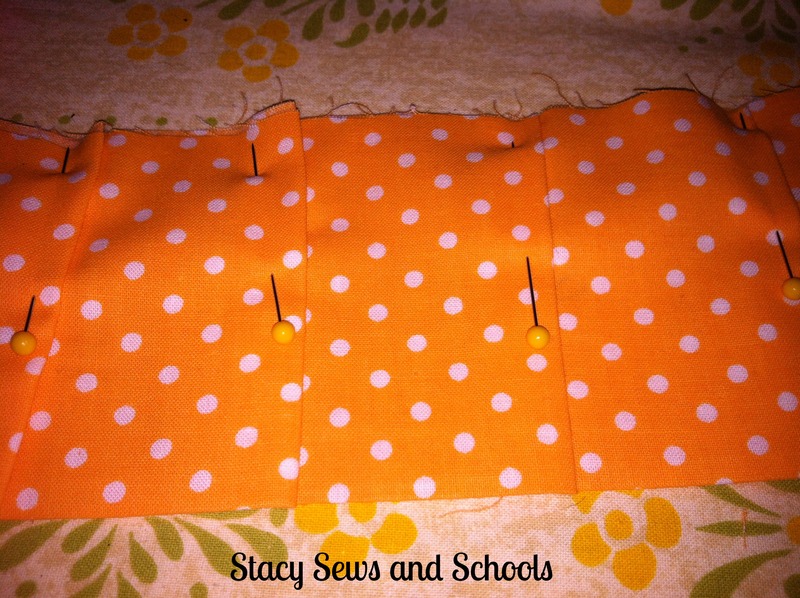 Wrap it around the center of the rectangle and sew in place.